I dont think it takes a review by Best Buggy for anyone to note that the Stokke Crusi with Sibling Seat really is an impractical pushchair for two children, on many levels. However the photos do not tell the whole picture, about how awkward and claustrophobic the Crusi with Sibling Seat is to use. This is where the Best Buggy’s hands on testing, with real life children, comes in! First of all, the Stokke Crusi as a single pushchair is largely very good. It is only in two child mode, with the addition of the Sibling Seat and adaptors that the Crusi becomes a real white elephant. We are purposely separating the two reviews out because we feel so differently about these two modes. 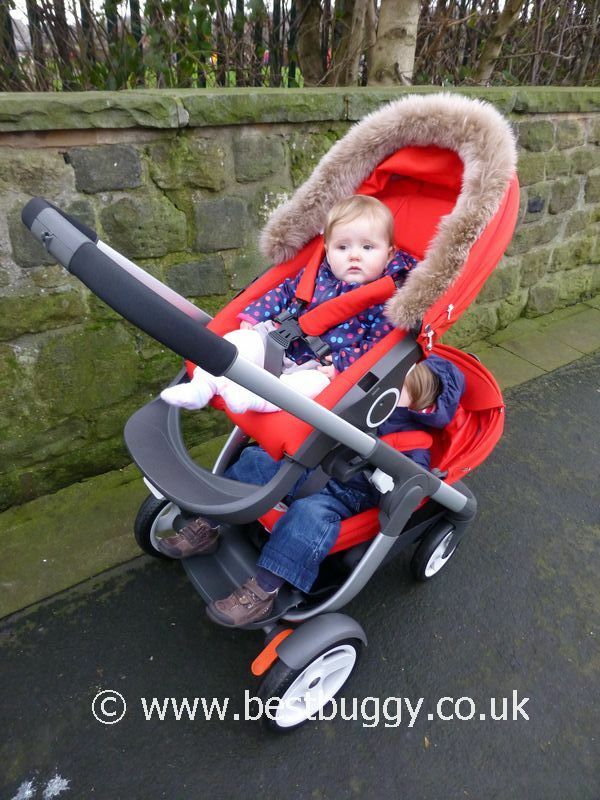 The Crusi in single mode review can be found under the “Single Pushchairs” section. Secondly, we were unable to access a Crusi carrycot but had an Xplory one here. The two carrycots are NOT the same, and the Xplory one must NOT be used. We here at Best Buggy had a long debate about whether to share these photos with our readers, but we felt that we needed to show an approximation of what it would be like for the child in the sibling seat with the proper Crusi carrycot on. We took the decision because a Stokke Crusi with Sibling Seat is an extremely expensive tandem option, and we at Best Buggy felt SO STRONGLY that there are MUCH better tandems and double pushchairs on the market for a lot less money. So let us STRESS the Xplory carrycot DOES NOT FIT and SHOULD NOT BE USED on the Crusi chassis. IT IS NOT SAFE. WE DO NOT RECOMMEND, or even want you to try. These photos are for illustration purposes ONLY! If Stokke would like to reply to our e-mail / contact, and facilitate us in taking photos with the correct Crusi carrycot on, then we would love the opportunity to replace these with the proper photos. But for now, you will get a good impression of how it is for the lower child. The Crusi with Sibling Seat can be bought in several ways. Fundamentally there is a Crusi chassis, an upper seat, a lower seat and sibling seat adaptors. A Stokke iZi Go infant car seat can also be attached. The Crusi can be bought as a complete tandem travel system set up which will cost an eye wateringly, extortionate price of £1,661. For just the pram and tandem option it is £1,476 and for just the two seats and chassis, its still a huge £1207!! The other option is to build your own Crusi with Sibling seat. The Crusi chassis (and raincover) on its own is £530! The sibling seat adaptors are £59. The upper seat is the same as the latest Stokke Xplory V3 Evo seats, and the lower seat is the same as the Stokke Scoot seat. It is possible to buy the seats individually should you already have an Xplory or a Scoot and require the other seat. Given we already had an Xplory and a Scoot, we took this ‘build your own Crusi’ option. HOWEVER – what the major retailers and Stokke are not making clear is that only the very latest Xplory seat units should be used. These were produced from November 2012 and this date is clearly stated next to the serial number on the base plate. Part of the modification has been to enclose the rear of the Xplory footrest to prevent toddlers from getting their fingers trapped in the upper seat. The Crusi instructions say that there is a new footrest available as a spare part, but to date we can not get Stokke to confirm the spare part can be bought, or any other modifications to the seat unit. It would appear that with the new version of the footrest (or we guess with the footrest removed) that an older V3 seat would be safe to use – but PLEASE check this out if you are considering this option. The Stokke Crusi chassis is long and flat when folded, but very neat and tidy to store. There is no storage lock on the Crusi chassis and it is really easy to slide the chassis open. The handle is stored down low and thus needs extending upwards. The button on the centre of the handle is easy to depress and the handlebar simply slides upwards. The handle needs a small tug to pull the handle out. Several times I thought I had fully extended the handle, but I had not. The next stage is to add the sibling adaptors. I have to say all round the instructions are nigh on useless – pictures only – which is no good when you are freezing outside and need help, with what are probably the hardest to put on seat adaptors I have come across to date. The seat adaptors are two rigid curved pieces of plastic. The instructions show how you fit the centre hole first (above the white strips in our photos). BUT the tricky part is fitting the two sockets at the top – these need to fit over the white seat recline buttons at an angle. So the recline buttons need pressing in, as at the same time you try to pull a rigid piece of plastic over the top without the buttons pinging back out, and then getting them to snap into position. At the same time we found the lower part of the adaptor righted itself into position and the adaptors dropped down so that they were also resting on the black ring inside the centre hole (see photos). So each adaptor is held on at two points the centre black ring, and over the seat recline button. The hard part was trying to make a solid piece of plastic flex into where you needed it to go! At the end I went “Phew” and moved onto the next part! It is certainly not something I would want to do every outing. The next stage is fitting the footrest for the sibling seat. This involves bending down, aligning two screws with screw holes, and then screwing them in. But the screws and the sockets are both at an angle. The screws move as you try to line them up and all round I got pretty frustrated trying to fit it. I thought I had the footplate on only to realise it wasn’t. So I had another attempt and this time the footplate felt fixed. But there is a follow up to this at the end of this review. Next went on the Sibling seat. This slotted on easily but IT ONLY HAS ONE FIXED POSITION – RECLINE! This is really really important to note. I have seen people say their 16 month old was happy in the lower seat but BE REALISTIC – how many people have a 6-7 month age gap between their children?? The Sibling Seat is apparently not meant as a permanent seat for a second child, but more as a place where a tired sibling can hop in to rest. I know from my own experiences, and those of others, that few children beyond the ages of 18 months, will tolerate being reclined whilst awake. In fact we attempted to put a number of children into the lower Sibling Seat and only my two (fully trained!) children, and a compliant 9 month old, would happily get into the lower seat. You can see the reaction of one child in the photos (used with the parents permission) – there was NO way she wanted to be reclined in the seat. Believe me bribery didn’t work either. My eldest absolutely 100% would not let me push her anywhere in it (which has never happened before!) and she could not wait to get out (and she loves trying pushchairs out). My youngest really is not a typical 2 year old and is very laid back in temperament. But there are photos here where he is straining to sit up or his head is bent forwards as he tries to see out. Would a really tired sibling get into the seat? Not my eldest anyway! When tired she’s most likely to protest that she doesn’t need to sit down in a pushchair seat. However some of our Best Buggy Focus Group have older compliant toddlers who would clamber in for the rest. But this is something you may not find out until long after you have your second (or third etc.) child. Not only that would you as a parent, REALLY want to put your child so low to the ground, in a position where you are unable to see them, and they can only see your feet? Stokke claim that its all about “Connection” with your child. So Stokke, what on earth happened with the Crusi sibling seat???! How is the ‘Connection’ between your child and your legs going to happen? To be fair, in two seat mode, there is more room between the seats at the head end of the Sibling Seat than there looks. If you have a placid child, who doesn’t mind a ride laid semi-reclined, then the Crusi Sibling seat may be an option.The footrest certainly seemed to be in a good position for even our tallest toddler. Not a single one of the parents we tried / showed the Crusi to in real life, said that they would ever consider putting their older child into the Sibling Seat. We have had similar reactions from our Focus Group with whom we have debated extensively who might buy or use this seat, and all the reasons why we would not. Between the Focus Group members, they have had over 150 double pushchairs, so I think they are qualified to apply their experiences. Some said their children would never have sat in the Sibling Seat. Others have said their child might have sat in it at specific, but short lived points in time because children grow and change. Even if your 12 month old – when you are 6 months pregnant loves it, thats not to say that by 15-18 months old or beyond when you really need to use the Crusi for two children, that they will still like it. Overall the views were that no one would buy it. One issue that we experienced was that the access for the lower child is poor. There is a lot of space at the head end, but the children who tried the sibling seat were unable to crawl out backwards through the front space. They were also unable to clamber out of the head end without some assistance. I did wonder whether the seat and adaptor would stand up to having children standing at the head end to climb in and out long term…. It is also difficult lowering a heavier baby into the seat and doing the harness up involves bending over at an awkward sideways on angle to do it up. I am not sure that on my average outing that I would forego the huge basket space to put a seat on that I may, or may not use. If you need a double pushchair, then you NEED a double pushchair! Not a VERY EXPENSIVE adaptor and second seat unit to use ad hoc! For the £328 the Sibling seat and adaptors would cost, you could buy another double pushchair as a stand by or a decent sling for the baby, so that the tired sibling could hop into the Crusi main seat. You can’t even have the Sibling Seat on as an emergency standby / tired toddler on the way home when shopping, because what do you do with your shopping when the sibling wants to hop in?! There is no room for a changing bag, or even the raincover. We have spent many hours thinking around who would use the sibling seat etc. We have debated whether after the first 6 months, the youngest child would be placed into the lower seat. It is certainly an option especially given most 6-12 month olds will sleep for much of an outing. But its also not the best way to connect with your young baby…. AND you have to get through the first six months. Which leads us nicely onto the first six months…. I dont think anyone who looks at the official Stokke photos of the carrycot with the sibling seat underneath, does not wonder who on earth would subject their child to that lower position on a daily basis?? Given we had most of the Crusi parts, apart from the Crusi carrycot, as an experiment, we decided to try our Xplory carrycot on the top. As we said at the start, this is not safe as the carrycot does not lock into position. It is also important to note that the Crusi carrycot is more curved at the head end, but we do not believe this will impact much differently on the lower child. But with careful supervision, we tried the Xplory carrycot on top of the Sibling Seat to get an idea of what it would be like for the lower child.It is clear that there is very little room for the Sibling Seat child. It feels enclosed and the carrycot is very close to the child’s head. As you can see on one occasion our child was quite happy, and on the other he clearly was not happy and was straining hard to get out. We removed him immediately. The only way to remove our child from the Sibling Seat was to remove the carrycot from on top. The upper connectors of the Crusi are high, and lifting off the carrycot with maybe a 5 month old baby on board from a height may be difficult for some. Its also not great if you have a potty training toddler who NEEDS a wee NOW!!! or if you had to have a C-Section. We believe that it may be possible to put the Stokke newborn wedge into the top seat and lie it flat as an alternative to the carrycot, but we have not tried this and have some doubts about whether it is indeed possible. The instructions seem to imply that the upper seat will only semi-recline. There is also a car seat option for the baby to go on top in an iZi Go infant car seat. Again be aware that the adaptors sit quite high. I think I would struggle to lift a 6-12 month old baby, that high in a car seat onto the adaptors to be honest. It is difficult enough on lower level adaptors to manoeuvre several kilos of baby into the right position. Obviously the handle of the iZi Go needs to be left upright or it will be in the face of the lower child. The Crusi main seat is the same as the latest version of the Xplory V3 Evo seat which has discussed has a solid backed footrest. We thought that the upper seat would be no problem at all. However, that is until you realise that the Crusi adaptor has just been fitted OVER the seat recline button!!!!!!!!!!! There is absolutely NO way, that we can see, that you can recline the seat either on the Crusi with the adaptors in place, or even off the chassis in your hands (with a lot of pushchairs you can manually turn the sockets to recline / sit the seat up). So, whatever position you place the top seat on the adaptors, is the position that the seat will be in for the entire outing. Given the upper seat is supposedly the seat the baby goes in, what on earth do you do when your sat upright little one falls asleep on you an hour into the trip? There is no way to physically recline them! Equally if you start your outing with a child asleep in the top seat, and they wake up, they are stuck in the reclined position for the duration. We have puzzled over the instructions, and played with the seat unit. The only way to recline the child seems to be to remove the seat, and then the seat needs to go onto either the single Crusi chassis, or onto an Xplory chassis, to be reclined and then it can go back onto the Crusi chassis!! This is absolutely impractical!!! I actually think this is more ludicrous than the permanently reclined lower seat!! We were unable to try to get the seat into a lie flat position for a newborn with the use of the newborn cushion / wedge simply because we did not have the means to rotate the seat recline whilst out and about. The instructions seem to imply it is not possible to lie the upper seat flat for use for a newborn in two seat mode, but we will stand corrected. The one BIG positive I will say for the Crusi with both seats on is that it is lovely to push. It feels well balanced and grounded. It is a smooth and comfortable ride. The handle feels good in your hand. There is a good range of handlebar height settings. There is adequate suspension on the chassis. The wheels are a good size. The seats themselves are easy to clip on and remove. The harnesses are good although a little difficult to tighten. The Xplory seat fabric needs undoing to alter the harness, but its easy enough to do but it is a sit-down-with-a-cup-of-tea job. Both seats have a good hood although we couldn’t get our lower seat hood to fully open as it bumped into the upper seat. The Crusi chassis came with its own raincover which was good to have. The brake is easy to find and feels decisive. The fold itself is easy – slide the handle down, press in the white buttons on either side of the chassis and the pushchair slides neatly together. There is no autolock but the chassis doesn’t particularly ‘flap’ when folded. The folded chassis is long. However the seats do nest neatly on top of the folded chassis. We had discovered that the Crusi folded with the Sibling Seat adaptor in situ. This was a real bonus because the adaptor was really difficult and frustrating to fit. The fiddly to fit sibling footboard also folded in situ. The downside of the Sibling Seat adaptor staying on the chassis, is that you then have no means to alter the upper seat recline between uses, ie if one day you want your youngest to go on top for a quick outing, or another day you want the eldest to go on top so that you can have a chat whilst the baby sleeps underneath. However at the end of our photo session, I was chatting to the parents as I folded the chassis, and a small silver clip fell off into the basket. At that stage, I didn’t know what it was, and so picked it up and popped it in my pocket. I took the Crusi to BB HQ to take photos there when a black metal circular piece rolled onto the floor. I took the photos and went indoors to have a good look. There we saw that the round black circular piece was one of the two central points onto which the adaptor hangs on the chassis. So, within hours of the sibling adaptor arriving, one of the main supporting points had fallen off the chassis. The photos at the bottom of this photo set hopefully show what fell off and how it should have fitted. I have to say at this point I was absolutely furious. I knew the Crusi with Sibling seat was always going to be problematic, but it was a lot more problematic than I thought. But that in itself was fine, because thats why we do what we do – so that we can try these pushchairs out and share our findings with potential buyers. However a pushchair which potentially costs nearly one thousand and seven hundred pounds to break on its first outing as a double is ABSOLUTELY NOT ACCEPTABLE!!! That small round metal piece was supporting the adaptor that my child was sat on. For that piece to fall off on the first outing from such an expensive, supposedly good brand, company was absolutely gobsmacking. This is not a low end budget pushchair. 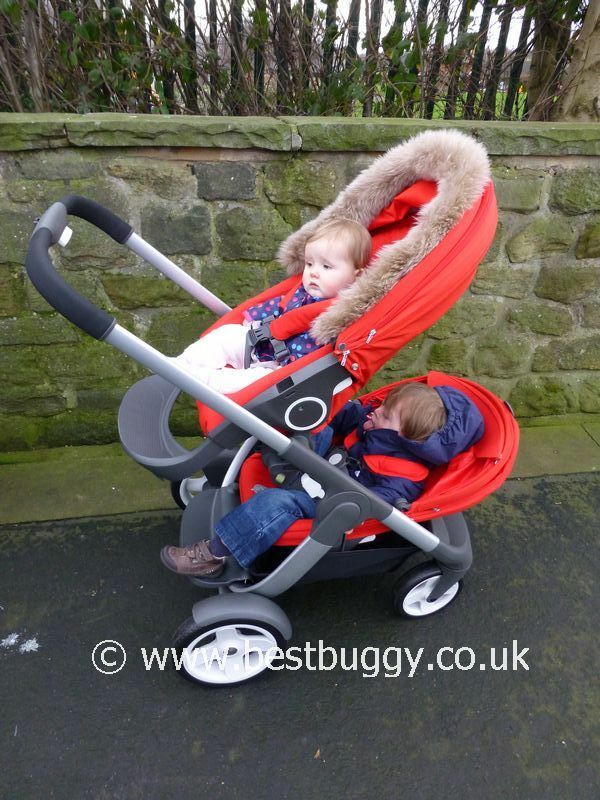 This is probably the most expensive double pushchair currently on the market. IT SHOULD NOT FALL APART ON THE FIRST OUTING!!!!!!!!!! On top of that, as we put the chassis back in the car the footplate fell off. That was really the final straw. That footrest, once screwed into place, should have been secure enough to permanently stay on. The Crusi was returned to the shop within the hour………. Apart from the advantages which you gain from the Crusi as a single, ie lovely chassis to push, high seat position for the eldest, easy fold and unfold, there are nothing but disadvantages to adding the Sibling Seat on. Absolutely DO NOT BUY IT.….nor put your child at risk on a seat which is balanced on two tiny small metal disks which pop off so easily. We know of five Crusi pushchairs that have been bought. Ours broke, and we also know that three of the other four brand new Crusi pushchairs arrived broken or broke within just 3 days of purchase. The handle broke on one on its second outing. The chassis on another didn’t stay locked when going up a kerb / step backwards, and on another Crusi the chassis only locked on one side. It really is not good enough for such an expensive product. I’m the contact for Stokke in the UK. MY email address is clearly available via Facebook and via the global Stokke website. I’m happy to answer any questions you have – but I’ve not received any emails from you. We e-mailed you in October for some information. We received no response. I therefore directed a message at you recently on Facebook, alerting you to the October e-mail. However this was ignored, and you continued to answer other queries. We have also asked specific questions in a conversation where you were replying, and these have gone unanswered. We have now managed to answer most of our queries through our own research. However, thank you for taking the time to reply. It is good to know that you are happy to answer any questions in future.